This is a model of the RhB class Ge 2/4 electric locomotive after being rebuilt in the Fifties. 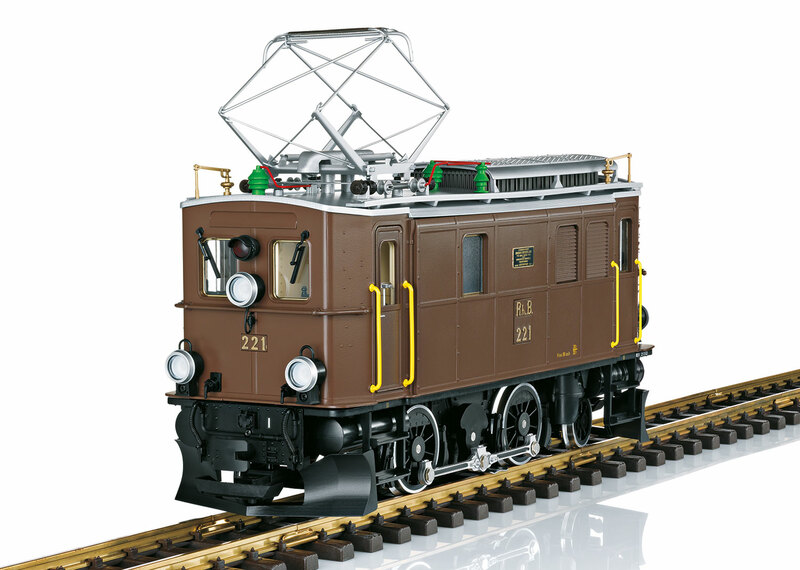 It has a new roof with a pantograph and resistance brakes as well as other changes compared to the original version. The locomotive has prototypical paint and lettering for Era III. Both driving wheel sets are driven by a powerful Bühler motor with ball bearings. The locomotive has traction tires. It also has an mfx/DCC decoder with many sound and light functions such as the headlights that change over with the direction of travel, cab lighting, and much more. Length over the buffers 38 cm / 15". 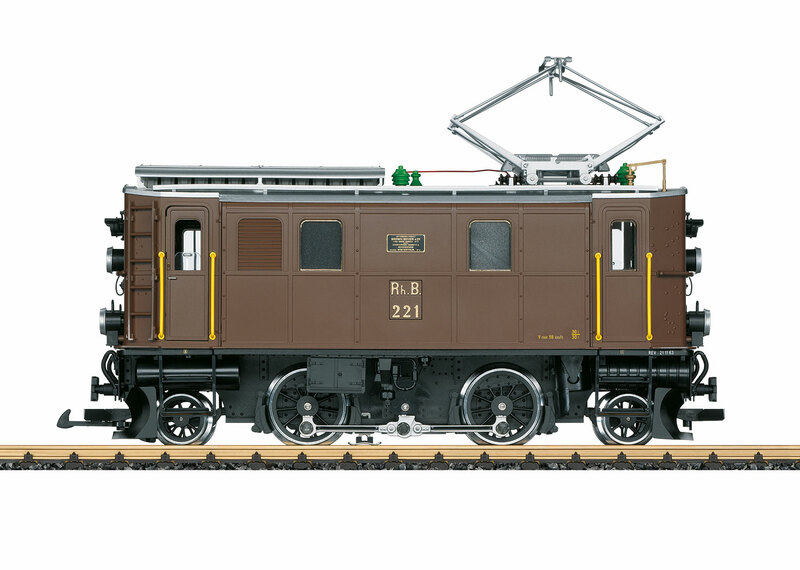 This locomotive will go well with the new 31522 and 32522 RhB passenger cars or the 34553 baggage car. RhB Class Ge 2/4 Electric Locomotive In 1913, the Rhaetian Railroad (RhB) purchased seven smaller Ge 2/4 locomotives with the road numbers 201-207 for lighter service in addition to four large Ge 4/6 electric locomotives. This was for its newly built electric line Engadin between Samedan and Scuol-Tarasp. These 8.7 meter / 28-1/2 foot long side rod locomotives scurried across the country at up to 45 km/h / 28 mph, had an output of 228 kilowatts / 305.75 horsepower, and weighed 36.7 metric tons. A repulsion motor with a double brush set (Déri motor) supplied the drive. It featured a high starting torque and jerk-free startup. The power was transmitted from the motor to the jackshaft by means of diagonal drive rods and then further by means of side rods to the two sets of driving wheels. Three units (road numbers 201, 202, and 206) were converted between 1943 and 1946 to switch engines with a central cab and two hoods. Two other conversions followed in 1945/46 with the goal of achieving a considerable increase in output for use as road engines. On road numbers 203 (new: 221) and 204 (new: 222) practically the entire electrical equipment as well as the power transmission was replaced. The output was increased to 456 kilowatts / 611.5 horsepower by installing new fast running single-phase motors. The drive to the jackshaft was now done with a gearbox and a new transformer provided regulated traction motor voltage by means of a camshaft relay. The maximum speed was thereby increased to 55 km/h / 34 mph. In addition, a separately excited direct current resistance brake system was installed. The braking resistors for this were mounted on the roof in place of a second pantograph. These increases in output and speed allowed both locomotives to be used as motive power on the steeply graded Albula line. After the arrival of the powerful, six-axle newly designed Ge 6/6 II locomotives, road numbers 701-707, by 1965 road numbers 221 and 222 were gradually pushed into subordinate (switching work) service. Especially in the high winter season when all available powered units were in use, they were often seen as motive power for the so-called "Schlittelzügen" / "Sledding Trains" between Preda and Bergün. They were also occasionally seen in pusher service on the short but steeply graded Albula south ramp. While road number Ge 2/4 221 had to leave service in 1998 and was soon thereafter scrapped, its sibling was preserved. It is housed as a historic unit in Landquart, and occasionally it attracts particular attention as motive power for special trains.